Before we move on to Pic of the Week I'd like to thank all those who wished me luck for giving a talk about the joys of writing to my niece's class on Wednesday. It went really well. Like most of you said, the kids were interested and were completely engrossed in what I had to say. To begin with I gave a little talk about my writing career to date; I took in the very first novel I ever wrote and was rewarded with oohs and aahs, then I compared it to one of my last novels (180,000 words and yet to be edited) and the oohs and aahs were replaced with gasps of astonishment and awe. After that my mind done a blank on me. All the points I had arranged to discuss disappeared and so we moved on to question time. I was there for an hour answering some superb questions about writing, and I could have stayed for the rest of the afternoon had the teacher not had other plans for her class. Public speaking can be terrifying for those who don't often do it, but the more you speak, the easier it gets (I learnt that from my days of theatre work). Having a low self-esteem, being self conscious about your appearence or the way you sound, such as Dark Conteur and Michael Offutt brought up, can hinder most people. I suffer with both these. I admit to be being on the cuddly side (years of sitting at a computer desk instead of working those muscles) and my voice sounds far younger and immature than I actually am. I also talk too fast, a trait that has carried through most of my family, and this often leads to me stumbling over words when nervous. These elements make public speaking very difficult, but if you remain calm, relaxed and take deep breaths, chances are you'll do just fine. Anyway, Pic of the Week. I had a pleasent shock this morning when I woke. I looked out the window and everything was white. We had our first dose of snow this season, and that cold, fluffy white stuff has inspired this week's choice. Introducing Tomasz Chistowski from Poland, a chance find and an artsit I'm sure we will be returning to in the future. 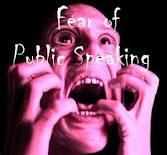 "In a poll of people's fears they found that death was number 2 and public speaking was number 1. 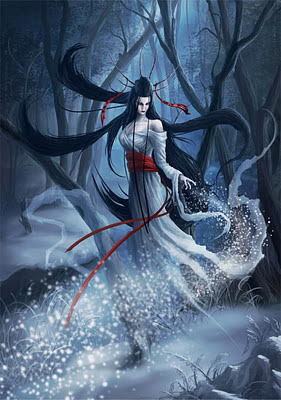 This means that people are more afraid of giving the eulogy than being the person in the coffin." Jerry Seinfeld. I'm sure you were awesome. Did you scare them? Will you keep in touch with them - they are, after all, your future readership. Yay! I'm so happy it went well for you! I knew it would be fine! Next stop is the lecture tour. Nice pic too. So, now you've done it twice, when are you going to do an audio book? Glad your speaking engagement went well. Kids make a great audience, I think. Public speaking is always tough for me since I have a bad stutter. I commend you for your work. I would also like to steal the neat teeth on the pic of the week.